If you drive into Gardiner, Montana, after the hustle and bustle of the short three months of summer, you’ll notice a tranquility settle upon the town. The locals relax, the wildlife wanders in from the park, and the crowds disappear. Glancing at the passing license plates, the traffic is distinctly more Montana based. 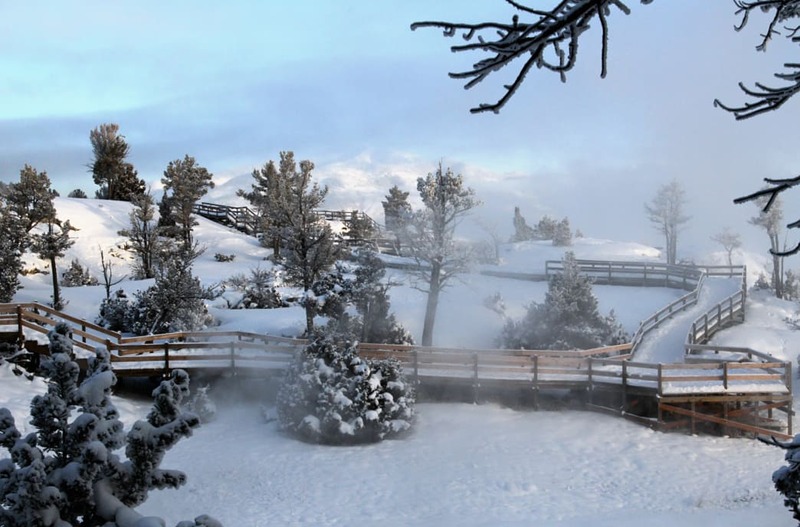 Yet spring, fall, and winter are ideal times to visit Yellowstone National Park. 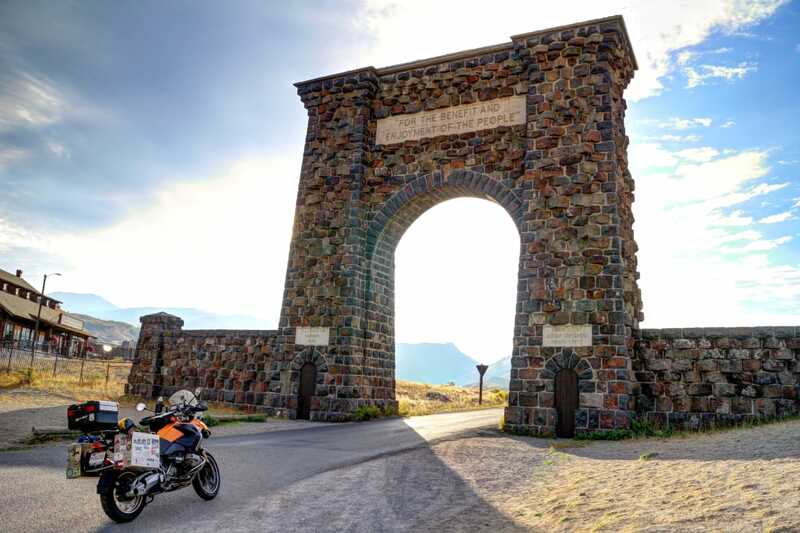 According to the Park Service, only 35 percent of the yearly visitation occurs outside of summer, which means that the off-season is the best way to avoid the crowds and experience Gardiner—and Yellowstone—in silence and solitude. Walk through downtown as the ice breaks up along the Yellowstone River and you’ll hear echoes careening off the canyon walls below Gardiner. When March sweeps in, spells of mild weather and longer days settle into the northern district of the park. Spring is the perfect season to get out and enjoy one of the most photogenic times of the year. It’s a time of new life in the park, and viewing Yellowstone’s wobbly legged baby animals can be a highlight of many people’s trip in the spring. With more than 60 different animal species in the park, you have a good chance of spotting these youngsters in the spring. Elk begin calving in late May and June, making them the most likely animals to spot for most people. Bison are usually born in April, able to stand within a few hours of birth. They will stay with the all-female herd for protection from predators for up to three years, so you’ll see the smallest members of the group learning the ropes. Bear cubs are born during winter hibernation, but step out with mom in the spring, usually around late March. They are one of the prized sightings in the park—but keep in mind that you never want to get too close to the mother and cubs. Bring binoculars and a zoom lense for your camera. Another unique opportunity to explore presents itself as the Park Service plows the roads connecting Gardiner and Mammoth to the West Entrance. For a brief window, bicyclists are allowed into the park while the roads are still closed to motor vehicles. This is an amazing chance to pedal the park in silence. However, make a plan and come prepared because spring in the Rockies can still be unpredictable. If you happen to be caught without the proper gear, Gardiner has plenty of shops like the Flying Pig Camp Store where you can find warm and comfortable layers. As the months advance into April and May, it’s a great time to get out on the lower elevation trails, such as the Black Canyon and Lava Creek, and search for waterfalls and wildflowers. Along the way, dig out your bear spray and keep your binoculars handy to watch elk calves and baby bison take their first steps. If you’re lucky, you may even see a mother grizzly and her cubs wandering down from their winter sleep or wolf pups emerging from their dens. After Labor Day weekend, the line of cars disappears from under the Roosevelt Arch and a steady stream of visitors slows to a trickle through the North Entrance. Pausing to listen in the early morning light, you might hear a bull elk’s bugle resound from across the Gardner River. Fall is the perfect time of year to drive up to Mammoth and hike the Hoodoos Trail or Beaver Ponds Loop. Autumn colors dot the mid-elevation landscape and, as you gaze towards Sepulcher Mountain, it’s a good time to look up and catch the passing raptor migration as they head south for winter. Keep your eyes peeled for golden eagles and goshawks traveling south in the afternoons. After the first frost, get out for a final night of camping or a late-season backpacking trip. The cool temperatures are a great excuse for gathering around a campfire at the end of the day. Here are a few campground recommendations for every vehicle type and recreational interest, from just outside of Gardinerto inside the park to nearby Cooke City. Pack along your rod for a day of fall fishing or, if you prefer, enjoy a weekend of world class elk hunting near town. While camping please remember to be bear aware and keep your food secure because hibernation doesn’t begin until well after the first snowfall. 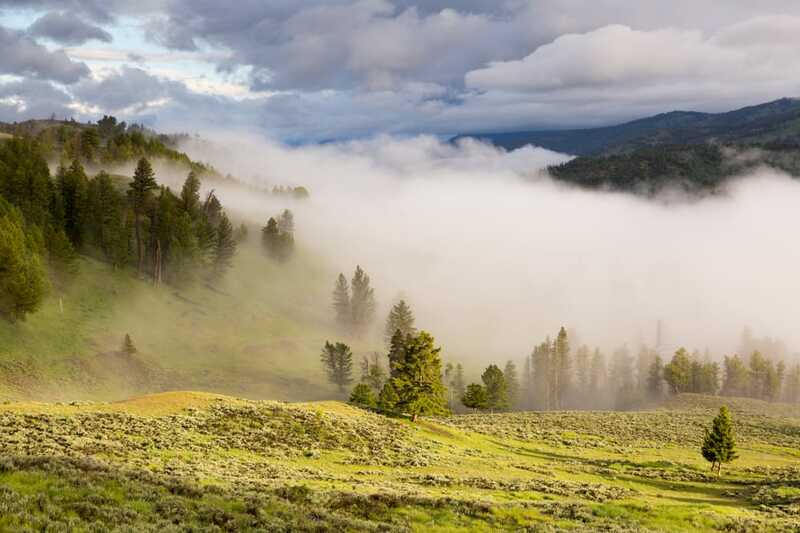 Once snow falls, Yellowstone’s magic comes to the forefront of the softened landscape. With the arrival of winter, head south from town to Mammoth and walk the Terraces. As steam billows into the frosty sky and warm water pools in blues and greens, the boardwalk is a spectacular place to explore and enjoy the silent beauty of Yellowstone’s winter. If you crave a bigger adventure, pack up your car with warm food and a thermos and head towards the Lamar Valley, before first light, for a morning of wolf watching. The winter snow forces the elk and bison out of the higher country and closer to the road. With a good lens, it’s fairly common to see wolves hunting on the edge of these herds. Winter is an excellent time to catch a glimpse of these carnivores on the landscape. Another great option for wildlife watching is to head to the trails around Tower Junction with skis or snowshoes. Across the Northern Range, there are miles and miles of groomed trails to explore and wander. Bison graze around the melted snow of Tower’s thermal features and the nearby waterfalls are stunning when they are paused as pillars of ice. On the way back to Gardiner, stop for a post-adventure soak in the Boiling River. This short trail to natural hot pools is an easy hike and a perfect place to unwind at the end of a day in the park. After a soak, Gardiner provides year-round dining and cozy lodging to enjoy on a cold winter’s night. This year, make it a goal to experience the magic of Yellowstone throughout the seasons. Gardiner serves as the perfect basecamp with plenty of options for food, lodging, and tour guides to help you explore. When you visit Gardiner outside of the busy summer season, you can enjoy small town Montana life and see the park with the locals. It’s an incredible experience that will stick with you for a lifetime. Written by Anthony Pavkovich for RootsRated Media in partnership with Gardiner CVB.